The Colombian government has accused the leftist ELN rebel group of displaying the severed leg of a soldier as a war trophy. Edward Avila lost both legs after he stepped on a land mine on Wednesday outside a village school. One of the legs was later found attached to the school fence in Norte de Santander province. "The ELN atrocity has brought shame and pain to all Colombians," President Juan Manuel Santos wrote on Twitter. Foreign Minister Juan Carlos Pinzon called the rebels "human rats". The soldier said he was unloading goods at the school in the village of Convencion, near the border with Venezuela, when the accident happened. "I remember I took a step, heard the explosion and saw my legs shattered," he told Blu Radio. "I remember clearly all the effort my colleagues made to take me quickly to hospital." He was taken to the nearby town of Bucamaranga for further treatment, but he had already lost both legs. "The challenges of military life make us strong," he said. "I have only lost my legs, I haven't lost my life. I am looking forward to the rest of my life." 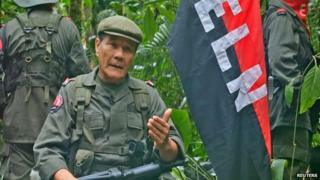 The ELN, or National Liberation Army, announced last year that it was willing to enter peace negotiations with the Colombian government. Talks have not begun, however, with President Juan Manuel Santos insisting that the left-wing group must first release its hostages. The government is engaged in peace talks with Colombia's largest rebel group, the Farc (Revolutionary Armed Forces of Colombia), in Cuba. The negotiations to end five decades of conflict began in November 2012. There has been agreement on several points, including the formation of joint forces of soldiers and the removal by rebels of landmines from rural areas. The de-mining agreement was announced on 7 March and more details have now been released. "Operations will begin in the next few days," chief Colombian government negotiator Humberto de la Calle announced at the end of another round of talks in Havana. Colombia is one of the most heavily mined countries in the world.